Imagine how you feel under the fluorescent lights at a middle school. Now compare that feeling to a dimly lit movie theater. Lighting sets the comfort tone for any room, but especially your home. If your house suffers from a bad paint job, outdated furniture, or some 1990s-style kitchen cabinets (*raising my hand*), just try tweaking the lighting. I know it sounds like I’m exaggerating, but good lighting can make a room look bigger, brighter, and fancier than cheap lighting. 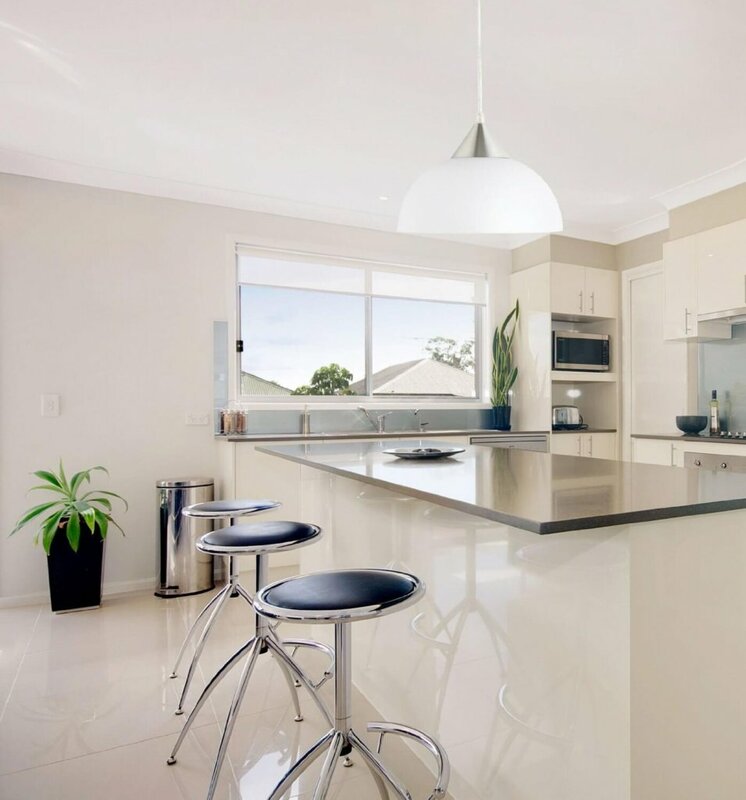 These days, great lighting is less expensive and easier than ever. You can easily install smart lights in your home, but before you go out and buy the first results on Amazon and get frustrated, let’s talk strategy. Installing your smart lights in just the right spots can accent your home’s style while also making your life easier. Here are a few smart light ideas to get you started. 1.0.1 Install bias lighting to improve your TV experience. 1.0.2 Make your office a place for inspiration with color-changing lamps. 1.0.3 Dim with your smart phone. 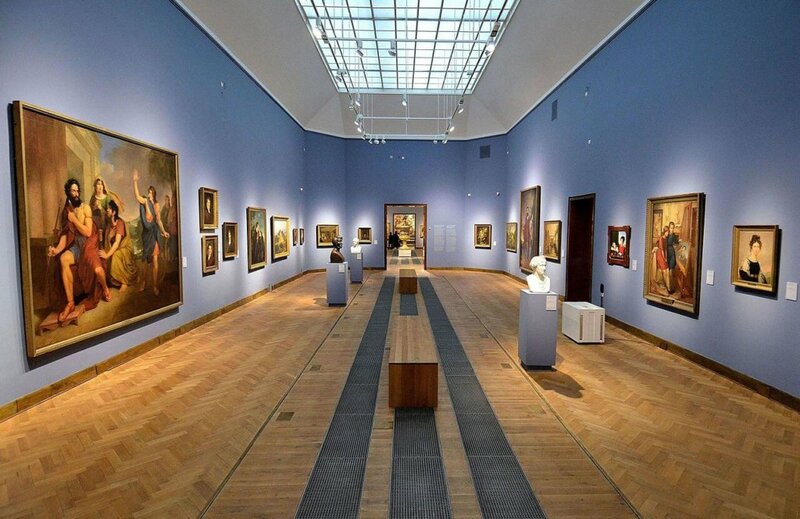 1.0.4 Use accent lighting to draw attention to artwork. 1.0.7 Smarten up your recessed lighting. 1.0.8 Task lighting is essential. 1.0.10 Match colors with the tone of the room. 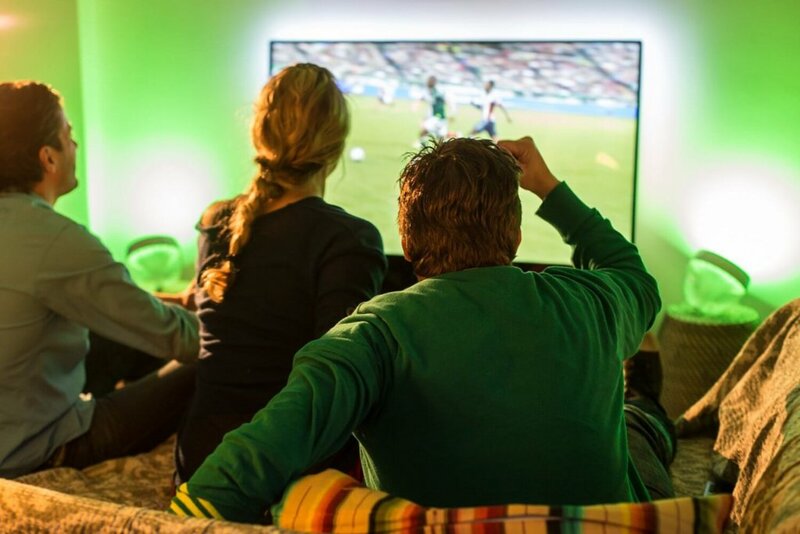 Install bias lighting to improve your TV experience. According to How to Geek, staring at a bright screen in a dark room causes our eyes to get tired. Usually our eyes adjust their brightness across the entire field of view, but a harsh contrast in brightness leaves our eyes feeling strained. By adding bias lighting behind your television or computer monitor, it raises the ambient light in the room to cause less strain on your eyes, without killing the mood with bright overhead lights. Bias lighting provides the contrast your TV needs to fully display dark colors like grays and blacks. Also, while this point isn’t as scientific, bias lighting just looks awesome. You can install smart bias lighting to control the color and brightness without getting off of the couch. Grab a Philips Hue light strip, or if you don’t have the money for a smart bias light then just get a standard bias light. Make your office a place for inspiration with color-changing lamps. It’s easy to feel overwhelmed by some lighting projects with complicated installation, but a lamp is pretty much the lowest commitment possible. Improving the lighting in your office or study can boost your productivity and help you actually want to work in your office instead of on your comfortable couch. Just look at what Twitter user @schmanke did with a simple LIFX multicolor bulb. Dim with your smart phone. Installing a dimmer used to involve calling the electrician and rewiring your home. Now it’s as easy as screwing in a lightbulb and downloading an app. Dimming saves electricity and can help you ease into sleep or feel energized in the morning. Set moods or schedules to make the dimming automatic, or get lights that work with Amazon Echo for voice controls. 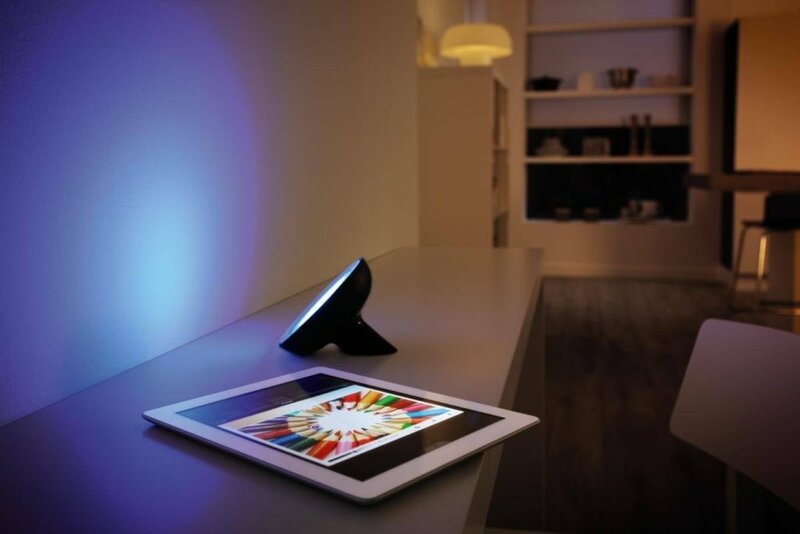 Almost every smart light bulb can dim your lights, from the advanced Hue system to a basic, inexpensive MagicLight. Use accent lighting to draw attention to artwork. Here’s the number one rule of lighting: illuminate whatever you want guests to look at. This picture from a blog by DIY Network shows what I’m talking about. The lighting draws your eyes towards the mirror, which is decorative, matches the colors of the room, and ties the entire area together. I guarantee that ugly fluorescent lighting on the ceiling would completely change the look of this bathroom. Instead of clean and modern, it would look dated with its more antique finishes. Light up a piece of artwork or create an instant accent wall without getting out the paintbrush. The Hue Bloom lights are perfect for accenting walls, images, and paintings to draw guests’ eyes towards the decor in your home. If turning lights on and off reeeeeally drives you crazy, you can take it a step further. While being annoyed that you have to pull out your phone to turn on the lights is definitely a “first world problem,” navigating to the right app can certainly be time consuming (especially compared to just flipping the switch like the good old days). IFTTT, which stands for If-This-Then-That and is pronounced “ift,” is an excellent tool for automating your lights. Select different rules, which IFTTT calls “recipes,” for your home lighting system. There’s the standard features like having your lights turn on at sunset, but then there’s also dozens of recipes that I promise you’ve never imagined before. Flash the lights when your favorite sport team scores. Or if it’s raining. Or if you get an email. Of if a space station flies overhead. Yes, really. Here’s one of my personal favorites, coming from the girl who loses her phone multiple times a day. Set up this IFTTT rule to be able to call your phone via the WeMo light switch on your wall. This opens up an entire realm of possibilities since your light switch doesn’t have to be just for your lights anymore. Backlighting conceals your lights behind something, like an accent wall, shelf, or opening by the ceiling. 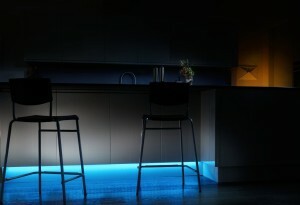 The lights add a glowing effect For colorful and smart backlighting, Hue light strips are absolutely the way to go. You can actually cut the strips short or connect them to lengthen, making the light strips any length you need. While I can’t point out the exact spot in your home where Hue light strips would look stunning (because, well, I’ve never been to your house), walk around the different rooms of your home and take note of plain areas that could use a little highlighting. For my home, I have 9-ft. tall ceilings that extend beyond my cupboards, resulting in dead space. While I could fill that with decor, I’m more of a minimalist and I think colorful light strips could accent the area and make it look awesome. This kind of lighting creates an illusion that the ceilings are even taller than they are by cutting out nasty shadows that make the area look drab. Other backlighting ideas would be behind mirrors, stairs, or crown molding in the ceiling. Smarten up your recessed lighting. It’s no secret that recessed lighting looks minimalist and great in almost any space. Commercial Electric created a smart recessed downlight that is compatible with the Wink hub. It’s designed to fit existing 5 or 6 inch recessed cans, giving you the smart lighting features you want within your recessed lighting on the ceiling. What’s task lighting? Think of a desk lamp. It’s the low, accessible lighting that helps you accurately see whatever you’re looking on. While ambient light might generally brighten up a room, task lighting is designed to help you get a closer look. Immediately after installing task lighting, you will be asking yourself “how did I ever see before this light? !” A few great places for task lighting include in the kitchen above where you chop or cook, in the bedroom for reading, and above the bathtub. Task lighting is especially great as a smart light since you can use voice commands through Amazon Echo or HomeKit to turn the lights on or off. This special feature is a game changer when your hands are covered in water in the bathtub or dough in the kitchen. 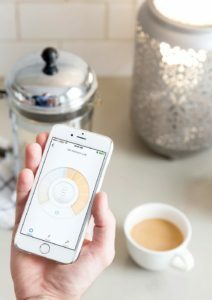 Combining your smart lights with other smart home tech like the Samsung SmartThings Motion Sensor, it’s easy to add security features that would normally cost you a hefty monthly fee. Using the IFTTT recipes that we mentioned before, just set up a recipe that automatically turns on your WeMo switch (which has a lamp plugged in) whenever motion is detected on the SmartThings motion sensor. Intruders will be scared off thinking someone is home, and if it’s just you or a family member then you can enjoy having the light on. As a side note, using the WeMo switch is great for retrofitting your current lamps without having to purchase expensive lightbulbs or hubs. WeMo Insight shows you useful data about the device including how much it costs you per month. You can use it to control anything that plugs into an outlet and use voice commands via Amazon Echo. In other words, you can say “Alexa, turn on the coffeemaker.” Pretty cool stuff. Match colors with the tone of the room. 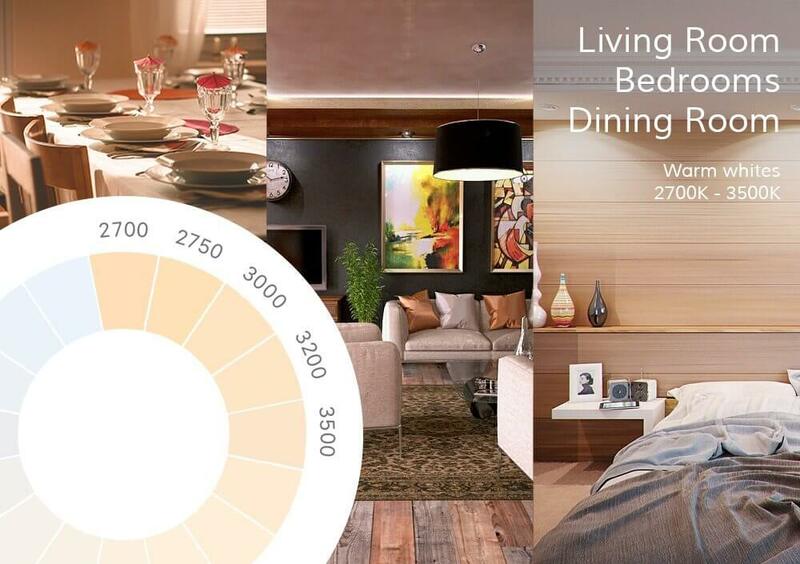 Did you know that different shades of lighting match the different rooms in your home? 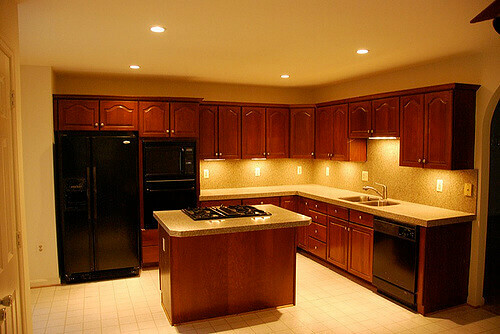 The same color of bulb in the kitchen, where you need to be able to see brightly while cooking and cleaning, would feel harsh in the bedroom, where you read and relax for the evening. LIFX describes it perfectly when describing their A19 bulbs. The bulbs aren’t multicolor which is why their pricetag is lower. But don’t get tricked into thinking these are the “cheap” bulbs; they can still change shades within the white/yellow spectrum. While that might not sound like a big deal, it can change the entire tone of your home’s rooms. The “K” in these images stands for Kelvin. The more degrees Kelvin, the whiter the color temperature. 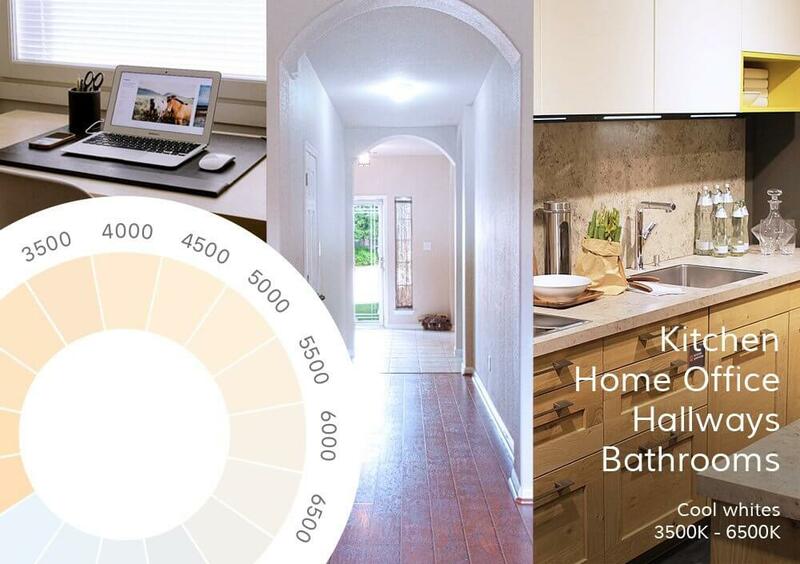 Get some smart bulbs and adjust the Kelvins for the different rooms in your home. You might be shocked how this seemingly subtle change can make it feel like you painted and redecorated because it highlights the contrasts in your room differently. To find the best lighting for your home, head to our WiFi Light Bulb Comparison for a fast and easy comparison. Who knows, maybe Jeff Goldblum will show up on your couch in a shiny jacket. Loved this post! We are huge fans of lighting in our home that is warm and soft and creates a nice atmosphere. Loved all of these ideas, and can’t wait to try some of them. I feel lacking in the lighting in my house now. Those all look so pretty! I love the ambient lighting behind the TV, I hate sitting in the dark. I need more lighting in my house!